You’re going to love this charming embroidery design! 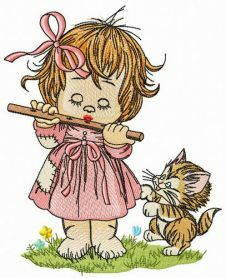 Meet the girl playing a flute in a green meadow. She is wearing a pink dress and a matching pink ribbon in her short auburn hair. The girl is looking delightfully focused on her performance. Beside her is a little tubby kitten looking very playful and excited. The two besties are enjoying their time out in the meadow! The detail-rich needlework comes in a mix of twenty-three colors. 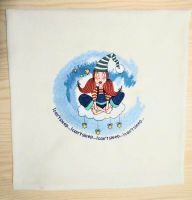 You can use this design to decorate any items of your choice: blankets, quilts, cushions, bed linen, napkins, towels, sweaters, T-shirts, pajamas and much, much more. The application stitches out very easily. Wonderful stitch out very happy with my purchase. Super fast download it !! Loved it! Great transaction! Stitched out great!! Super Cute on infant bubble suit!! I love you girls colection. Love this pattern although I have not embroidered it yet. It shipped immediately and stitch up beautifully. I've downloaded this pattern and already stitched out on a body-suit for my new-born niece. My relatives live in 9hrs flight from me! 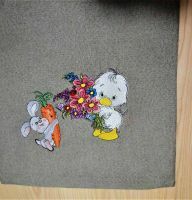 Embroidering is a great opportunity to send them the warmth of my hands. The little lady with flute looks pretty and I changed several colours, to make it a bit brighter. THank you for free designs! 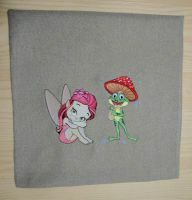 I've stitched out several ones, they are perfect either.